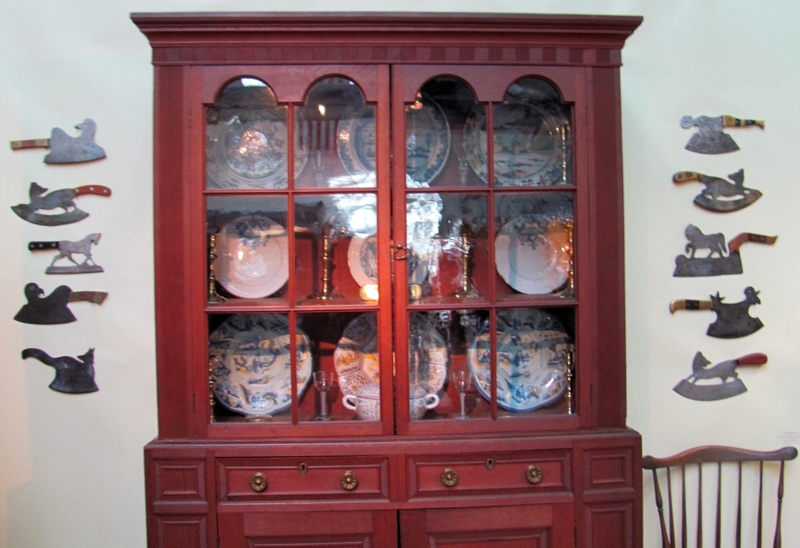 Northeast paint and color were in full bloom in the booth of Jewett-Berdan Antiques, Newcastle, Maine. 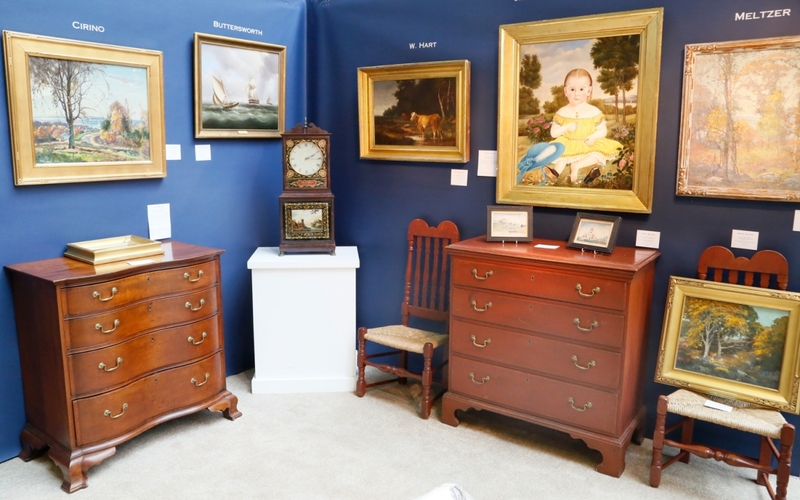 Both the clock and blanket chest to the right of it hailed from Shaftsbury, Vt., from the 1830s. 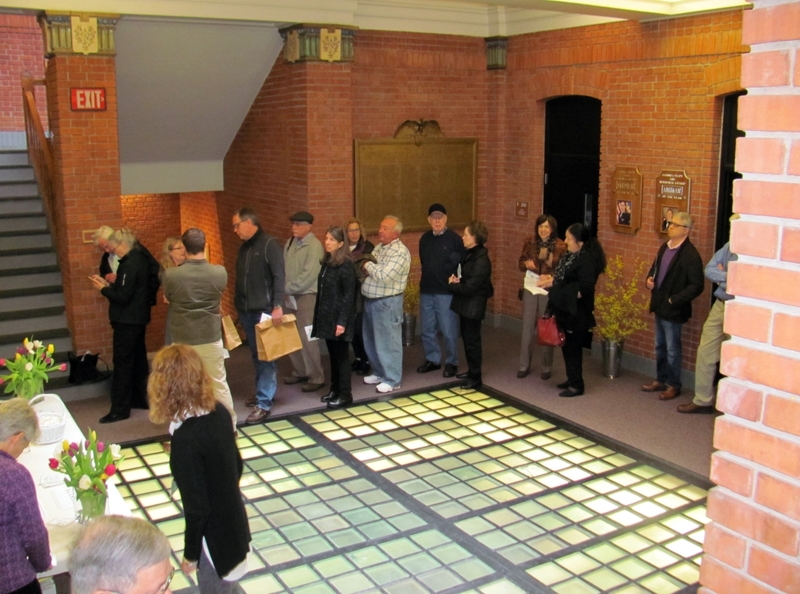 HARTFORD, CONN. – The Connecticut Spring Antiques Show opened at the Hartford Armory on a cool but clear morning with a long line of attendees waiting for the floor to open. 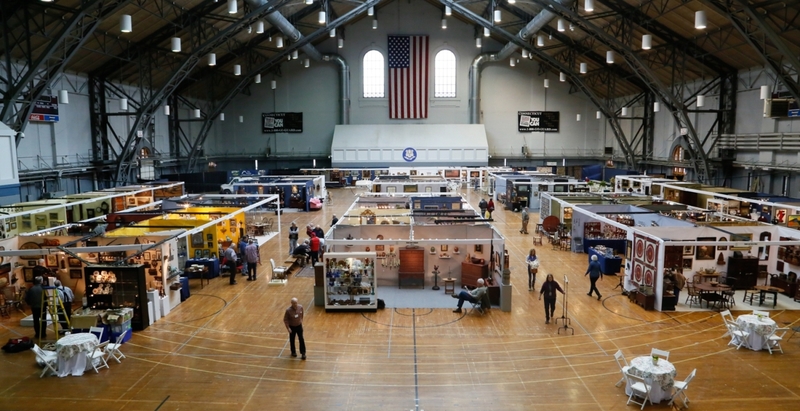 The sun streaming through the windows of the armory created a wonderfully warm and bright atmosphere that made objects stand out and allowed for good looking – and buying! 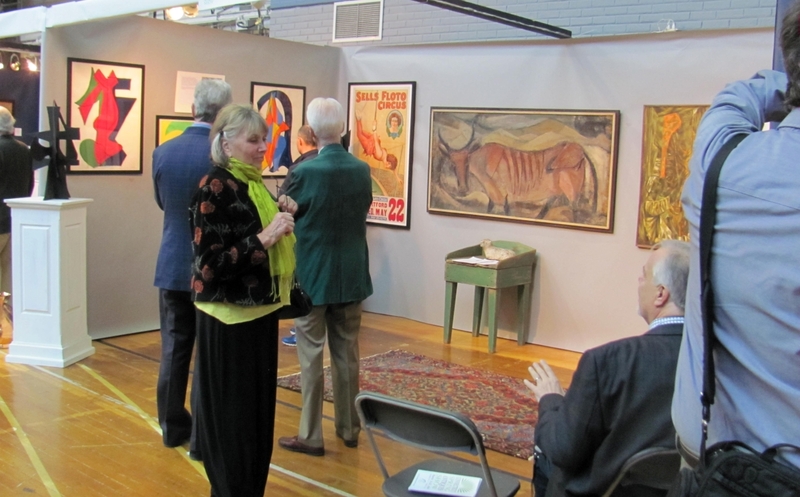 Attendance at the March 24-25 show was a little brisker on Saturday than on Sunday, but both days saw good, consistent traffic. Show manager Karen DiSaia reported that while the attendance was a little less than last year, it was comparable to past years. She noted that there were a larger number of younger attendees than she has seen in past years, and she was optimistic that the show was connecting to a younger audience. DiSaia believed that the show had not been impacted by either the nor’easter that blew through a day or two before setup, or the March for Our Lives, which was being conducted around the corner on the first day of the show. 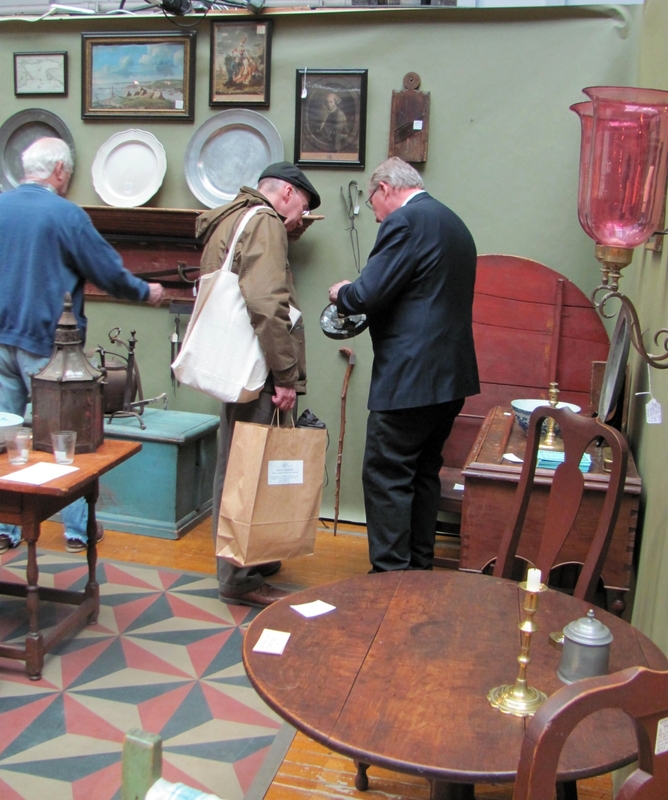 All the dealers who were expected to be there came, with ten dealers being new to the show. 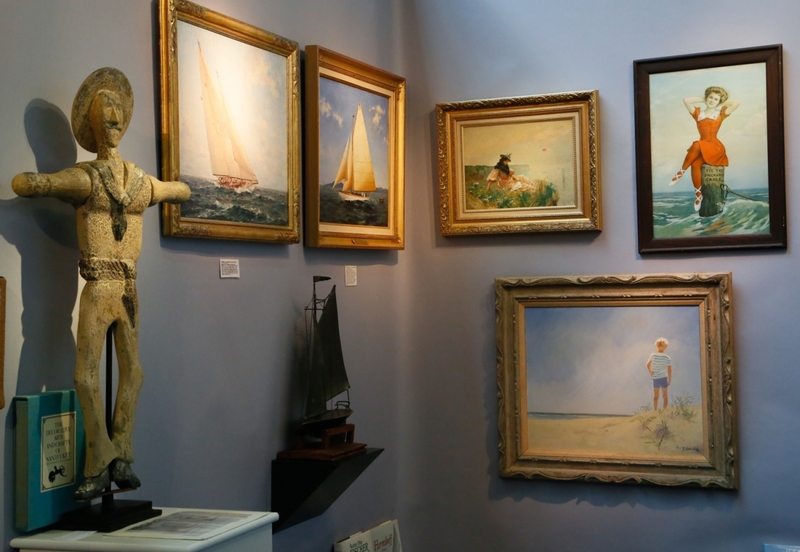 While the number of dealers exhibiting was a little less than DiSaia would like, she sets a high bar for exhibiting in the show and this was apparent in the quality of the works dealers brought. 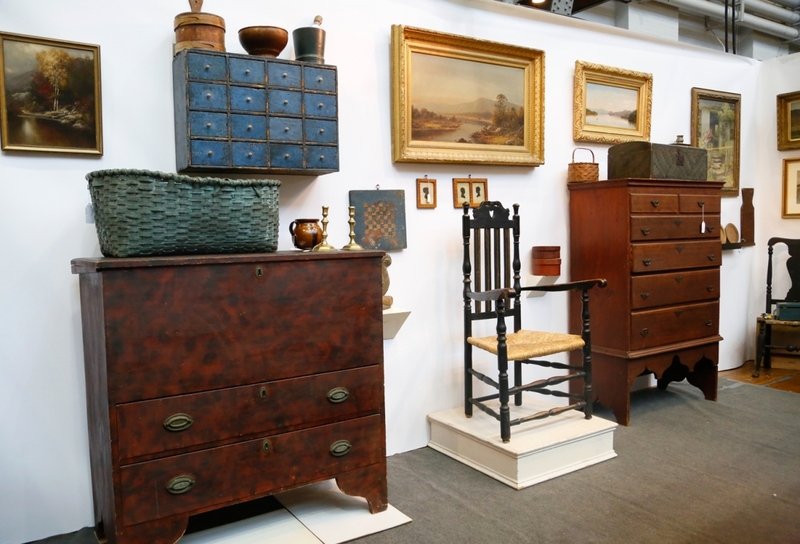 High style and case furniture is always well represented and showgoers had many choices. Litchfield, Conn., dealer Jeffrey Tillou brought a rare Woodbury highboy with stepped top, an early Wallingford highboy was in the booth of David Good of Camden, Ohio, and several pieces of Connecticut furniture were with Nathan Liverant and Son, Colchester, Conn. Firehouse Antiques, Galena, Md., brought a Wethersfield highboy, while Stiles House Antiques, Woodbury, Conn., featured a Chippendale serpentine chest of drawers attributed to New London, Conn. 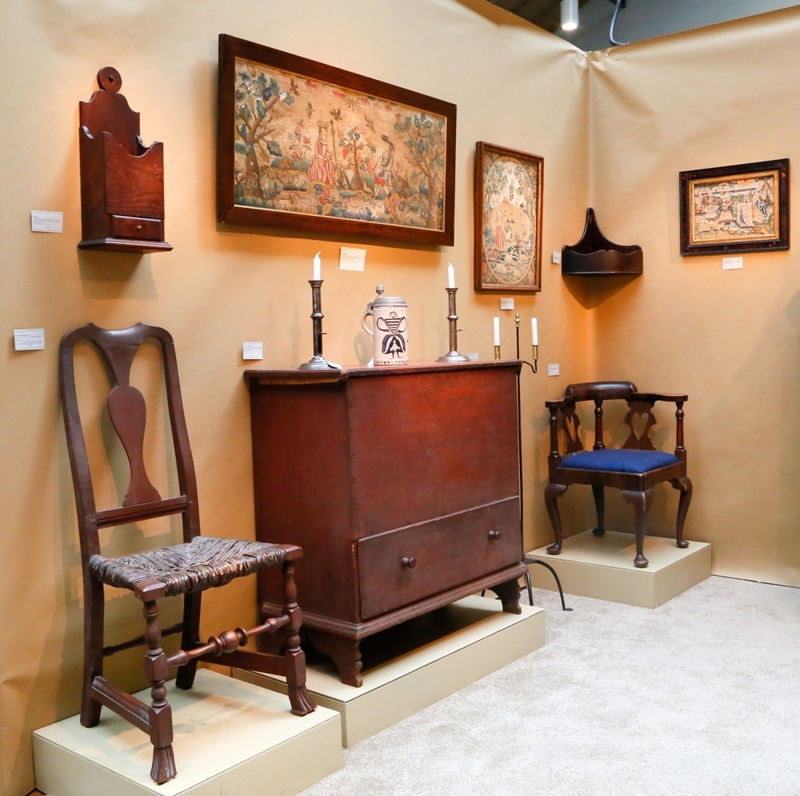 The Hanebergs of East Lyme, Conn. had a Pembroke table that was the mate to one in Charles Montgomery’s book American Furniture: The Federal Period, and it had pride of place in the front of their booth. After the show, Bob Haneberg reported several sales. 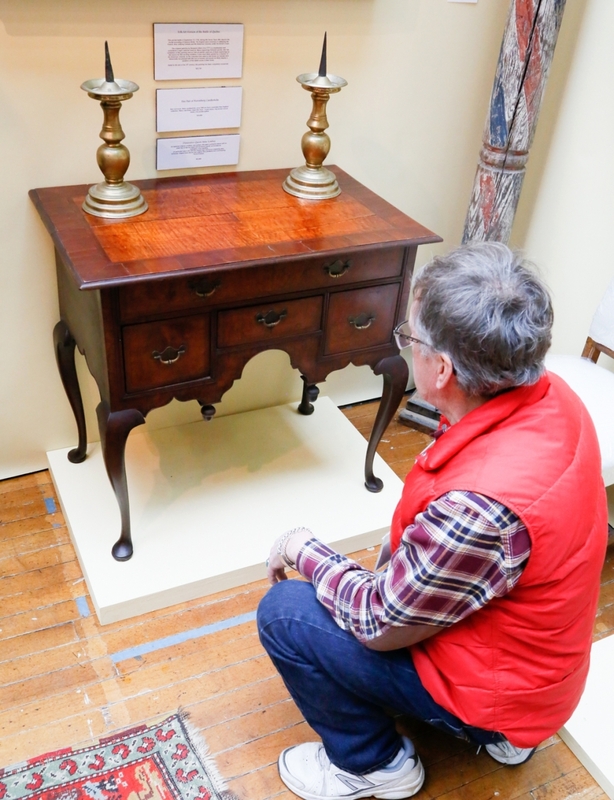 Daniel and Karen Olson, Newburgh, N.Y., brought – and sold – a diminutive Eighteenth Century New Hampshire highboy, a splay leg tray top Queen Anne New England stand, an inlaid Federal candlestand and several other pieces of furniture, decorative works and paintings. Grace & Elliot Snyder of South Egremont, Mass., displayed a good selection of early American and English furniture; Woodbury, Conn., dealer and auctioneer Tom Schwenke had a good selection of Federal furniture; and James Kilvington of Dover, Del., had a New Haven, Conn., blanket chest and a maple highboy attributed to Moses Hazen Jr of Weare, N.H. A large slant lid desk with massive ball and claw feet was with Thistlethwaite Americana, Alexandria, Va., and a great Hudson Valley kast took up most of one wall in Newbury, Mass., dealer Peter Eaton’s L-shaped booth. 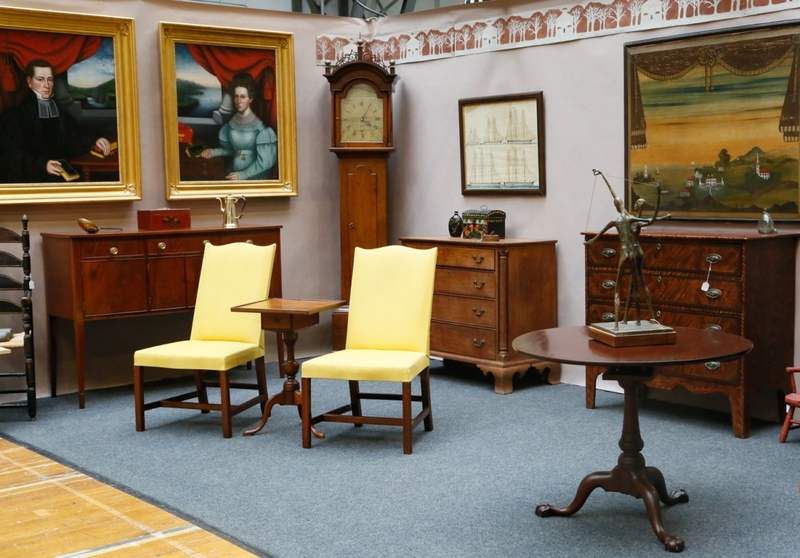 By the close of the show, Samuel Herrup Antiques, Sheffield, Mass., had sold a small Queen Anne table and an Eighteenth Century English sofa, as well as some other decorative objects. 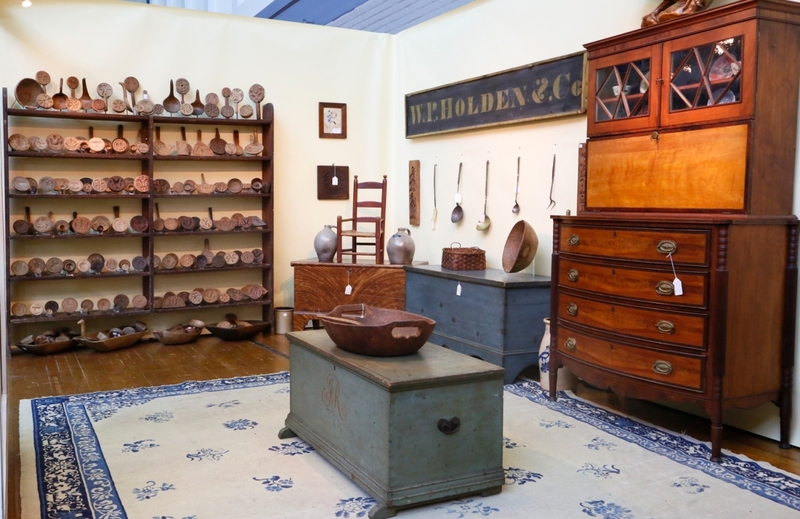 Standout pieces of folk art and painted furniture included a set of six vibrant yellow-painted Windsor side chairs in the booth of John Chaski, Camden, Del., while Collecting The Past of Whitakers, N.C., had a miniature painted six-board chest with what appeared to be a wedding scene. Randi Ona, Wayne, N.J., featured a gray painted game table with painted checkerboard top. 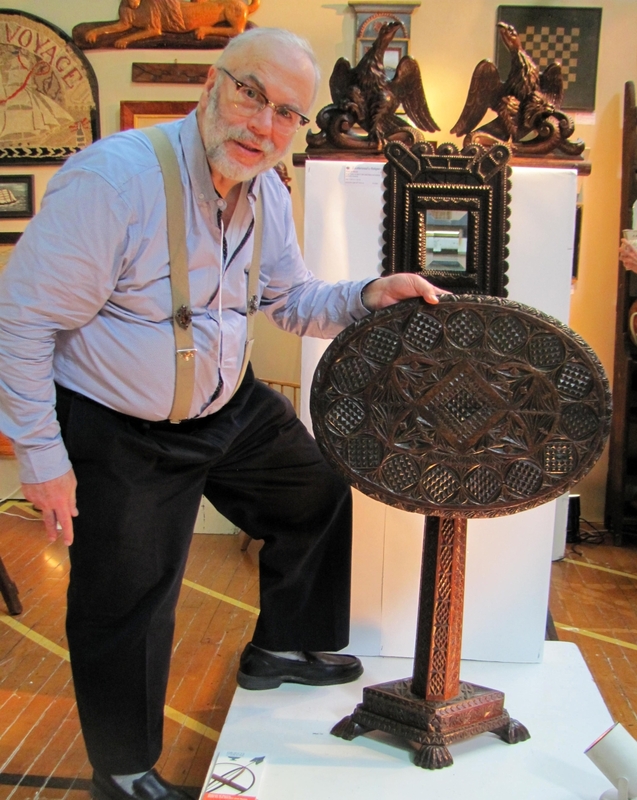 Sandwich, Mass., dealer, Mo Wajselfish, of Leatherwood Antiques, Sandwich, Mass., was quick to point out a dynamic chip-carved oval tilt-top stand that he featured at the front of his booth. The light from the Hartford Armory’s high ceiling has a way of making antiques look good. 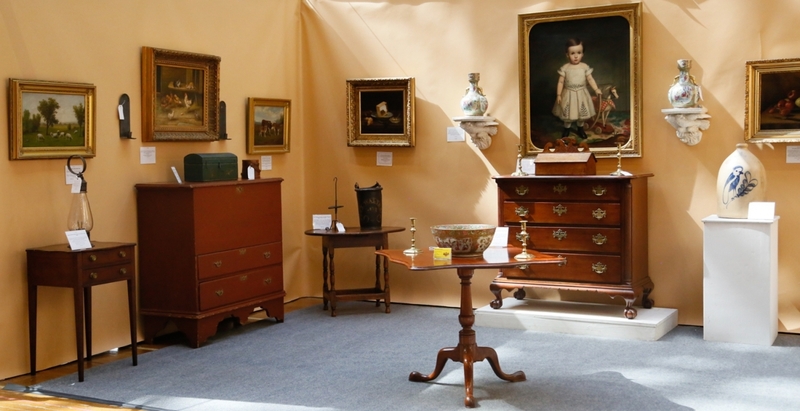 Just over 50 dealers set up shop here for the 45th edition of the Connecticut Spring Antiques Show. 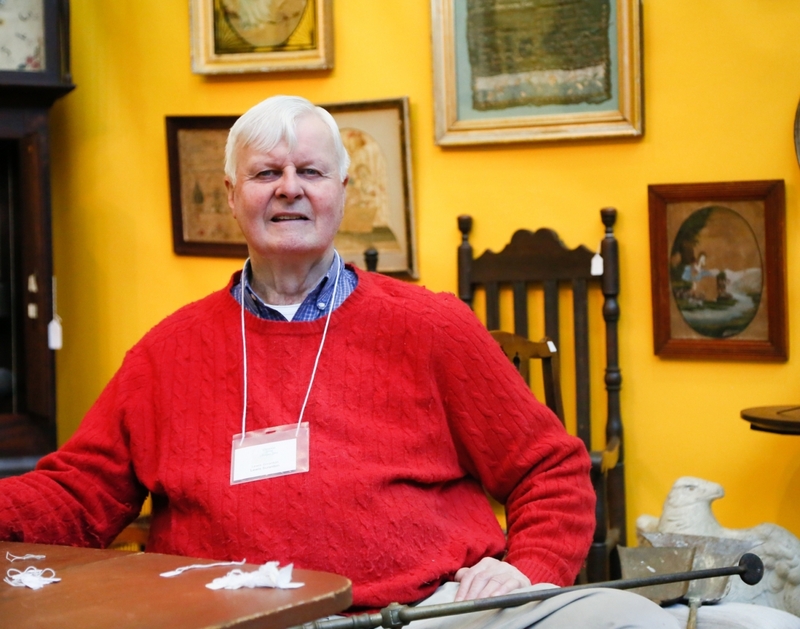 Both Karen Olson, Daniel & Karen Olson Antiques, Newburgh, N.Y., and Axtell Antiques, Deposit, N.Y., brought carved works attributed to John Haley Bellamy, and both with ties to the Masonic Order. Olson’s was a small mirror with portrait medallion centered in the top and a wingspread eagle along the bottom. 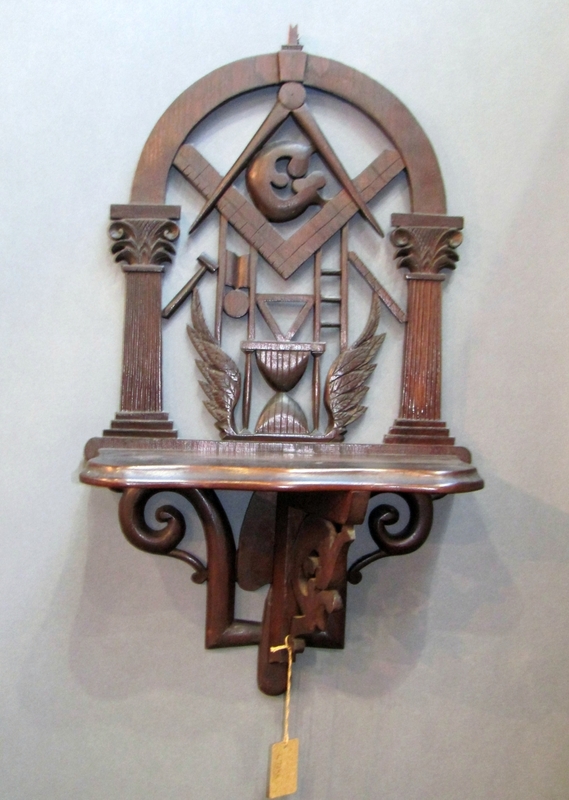 Axtell had a bracket shelf with the usual insignia. 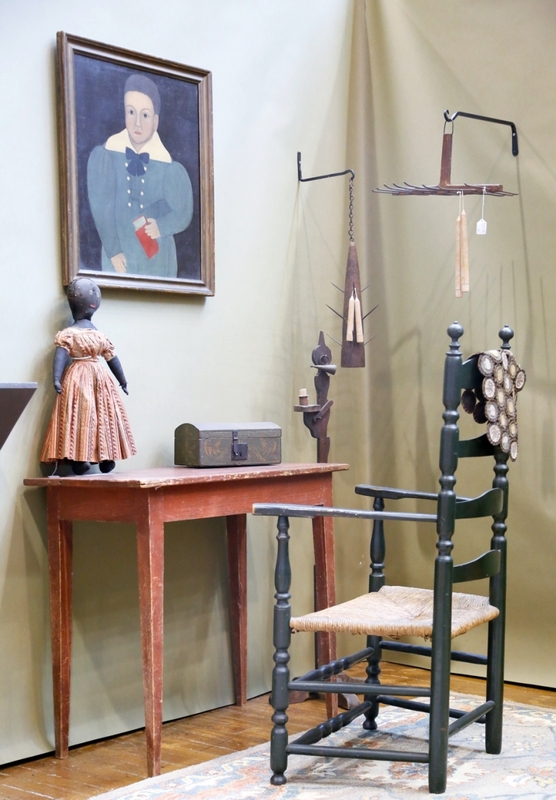 Hilary and Paulette Nolan, Falmouth, Mass., brought their usual assortment of nautical items and sold a Nantucket sailor whirligig and some Canton, as well as a circa 1820 apple-green painted hanging cupboard from Maine. Portraits were well represented throughout the show. 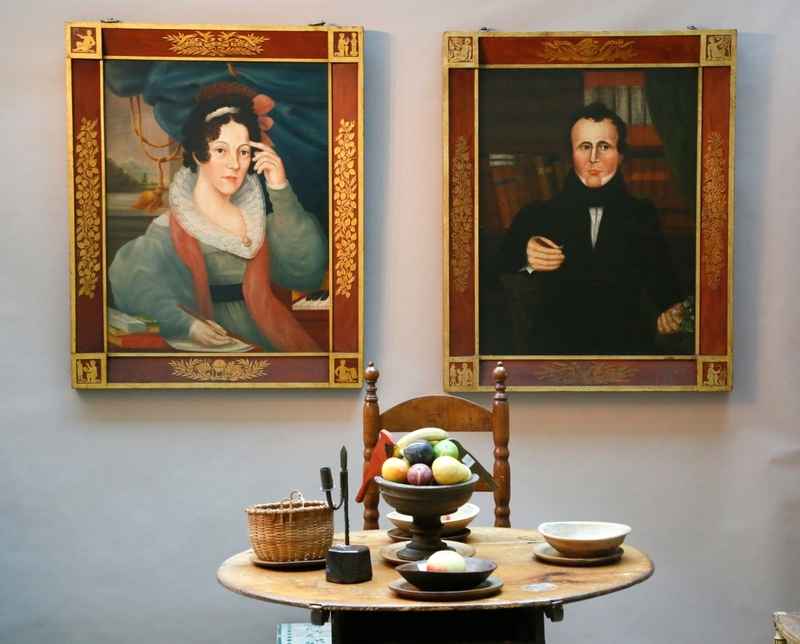 Nathan Liverant and Son had a pair of striking portraits of a man and his wife that Arthur Liverant said were new discoveries and the subject of upcoming research by his colleague, Kevin Tulimieri. Thistlethwaite, Americana had brought a portrait of a Miss Porter’s School teacher by Charles Foster. A striking mourning portrait attributed to Edward Savage caught the eye in the booth of Samuel Herrup Antiques, Sheffield, Mass., as did a large Joseph Whiting Stock portrait with Roberto Freitas American Antiques and Decorative Arts, Stonington, Conn., and a pair of portraits with Rockingham, Vt., dealers Stephen-Douglas Antiques. 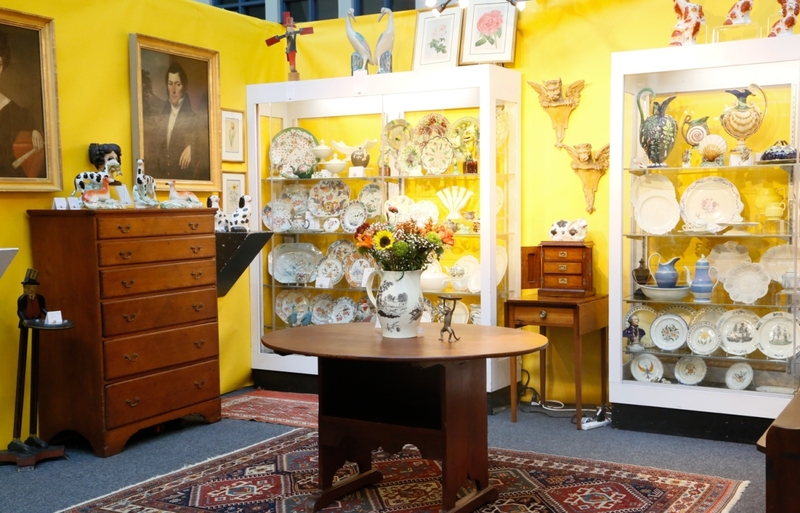 The booth of Donna Kmetz, Douglas, Mass., was hung with vibrant landscape scenes shown off by a bright yellow wall. She said interest had been positive and she had made a few sales. 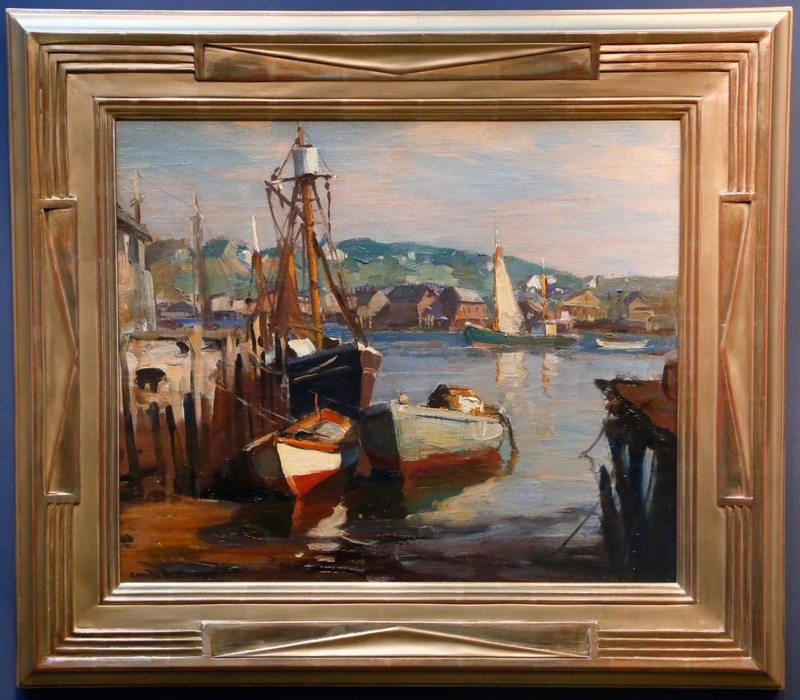 Those with sharp eyes would find a copy of an Antonio Jacobsen painting, done in miniature for a dollhouse, in the booth of Michael Leslie of Port ‘N Starboard Antiques, Falmouth, Maine. Steven and Carol Huber, Old Saybrook, were back at the spring show after a 15-year hiatus and brought a wonderfully varied selection of needlework, hanging the back wall of their booth with works from Hartford, Wethersfield and Glastonbury, Conn., including six from the Misses Pattens’ School in Hartford, Conn. One of the more interesting items in their booth was a large framed apron from the Free Gardener’s Society. Stephen Huber said it was one of only two he knew about and they had handled the other one as well. After the sale, Carol Huber said a lot of master gardeners had come to the show and were attracted to it. 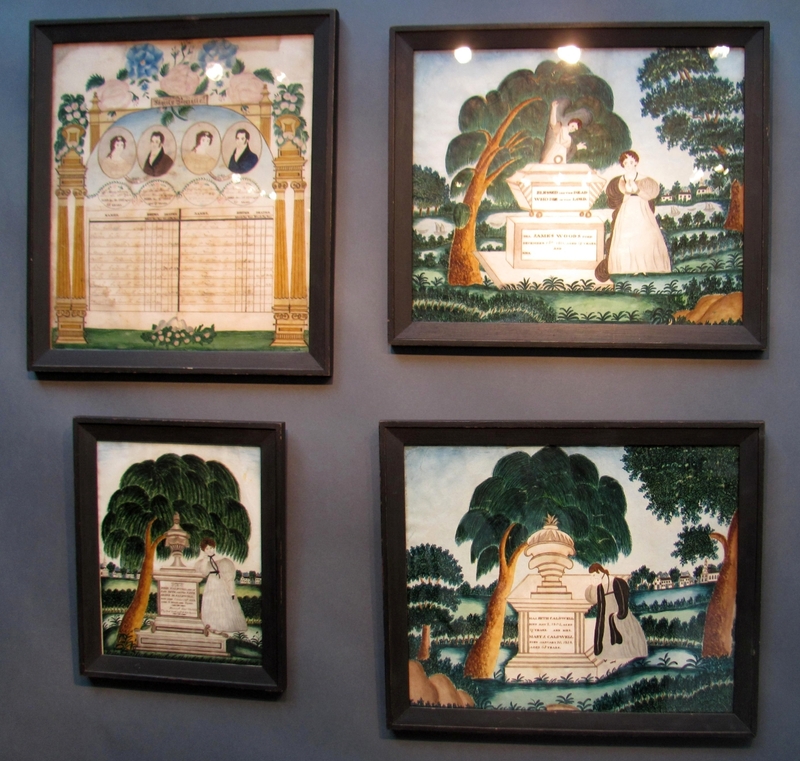 By the end of the show, they had made several sales, including an early Eighteenth Century Boston canvas work piece and a Seventeenth Century English canvas work. 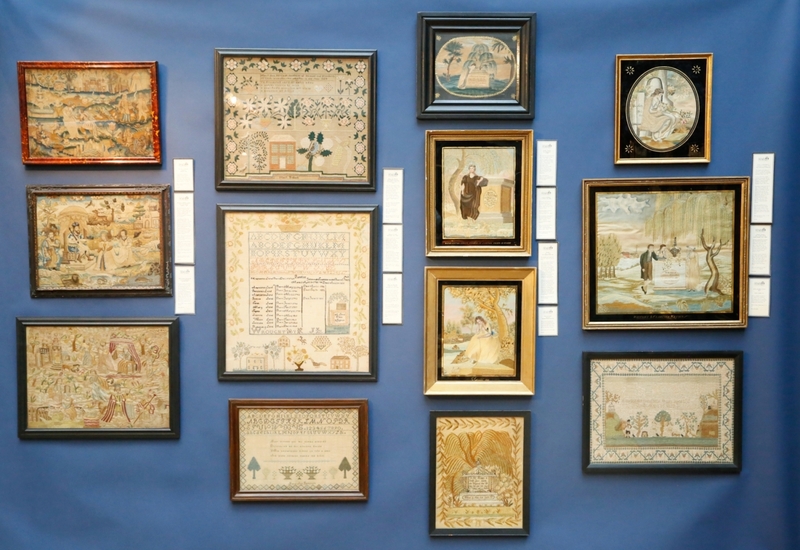 Peter Eaton, Newbury, Mass., had a rare set of four Caldwell-Woods family history needlework, while an unusual octagonal tabletop with embroidered cover stood out in the booth of Elliot & Grace Snyder, South Egremont, Mass. The Snyders reported many sales, most during the show, but also after. Mark & Marjorie Allen, Laconia, N.H., brought a nice selection of iron choppers with carved handles; Mark Allen was happy to explain that connoisseurs looked for rare and unusual ones, with fox handles being the most common, then birds, then horses. He had several in his booth, most of them European and all priced individually. James Kilvington, Dover, Del., had a fun inkwell in his booth that had two carved lions on the top. He said it had been made by a decoy carver and had come from the David Hawthorne estate. An amethyst glass decanter set with the original three bottles was one of the best pieces in the booth of Martin Chasin Fine Arts, Fairfield, Conn., and three pieces of red, white and blue Pittsburgh glass in the booth of R.G.L. 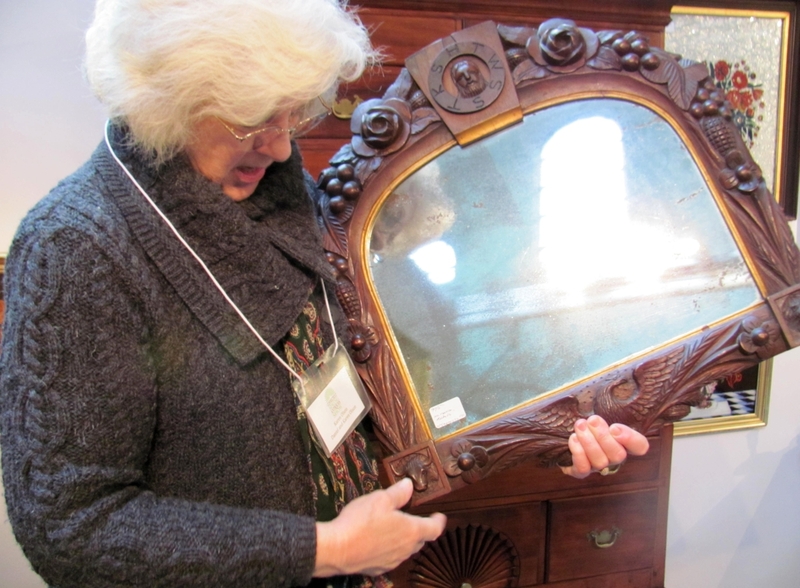 Antiques of Pittstown, N.J., immediately caught the eye. Several booths had good ceramics offerings. Jesse Goldberg, Artemis Antiques of North Salem, N.Y., had brought four rare Presidential Liverpool jugs, which include the only known example of one featuring President Monroe. He sold the John Adams example in the first few hours of the show. It was one of several sales he made, which included a pitcher with a polychromed ship flying a 15-star American flag and a historical blue and white Staffordshire pitcher showing Lafayette visiting the grave of Benjamin Franklin. 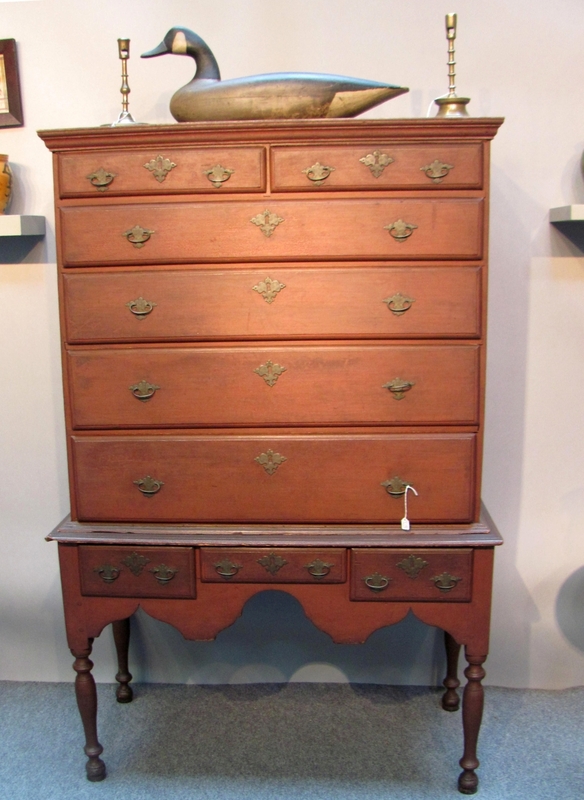 Elliott & Grace Snyder, South Egremont, Mass., believed that the diminutive one-drawer blanket chest at center was likely from Connecticut, circa 1760. It was in original condition including the red paint and shaped feet. The 1760 corner chair to the right of it was also likely from Connecticut, with a grain painted surface and heart cutout splats. 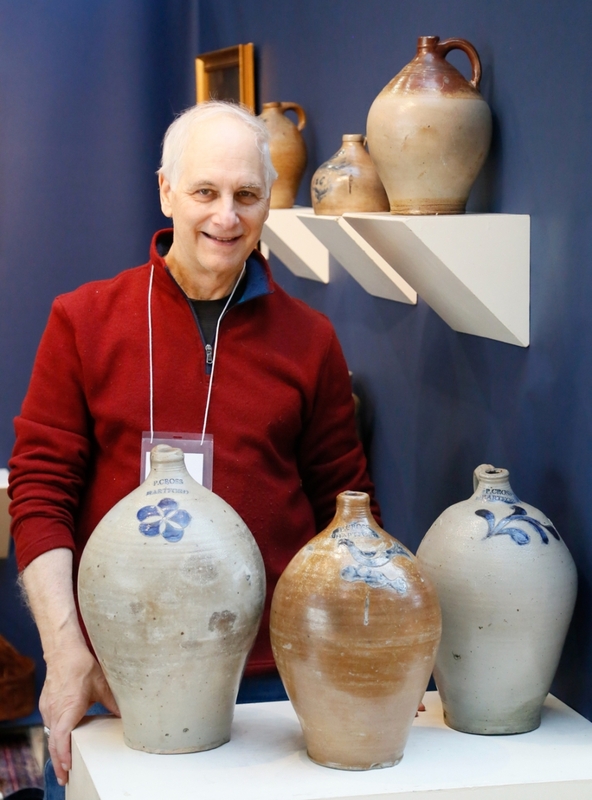 Steve German of Mad River Antiques, North Granby, Conn. was happy to show off the Bosworth stoneware churn with “Goonybird” decoration, the only one he had ever seen. 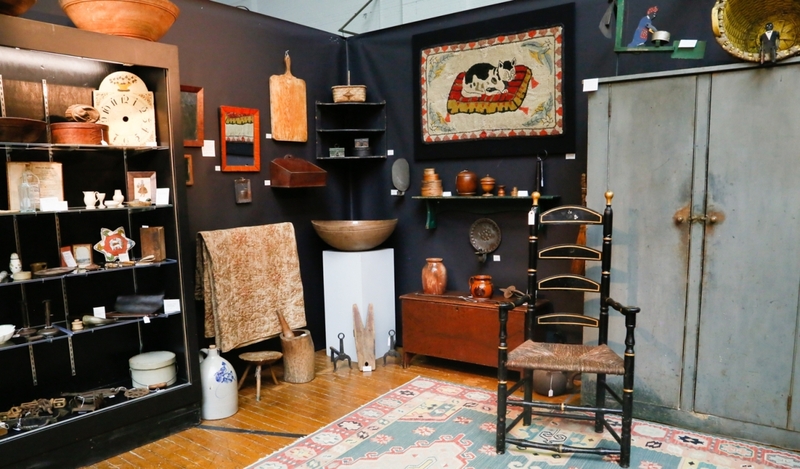 By the end of the show, he sold many things, from a weathervane and furniture to stoneware, redware and several smalls. Stephen Corrigan and Douglas Jackman of Stephen-Douglas Antiques had a great redware cutlery tray dated 1865. Melvin & Bette Wolf, Flint, Mich., had brought a gleaming assortment of pewter. When asked what his rarest piece was, Melvyn pointed to a Lancaster, Penn., chalice. He also pointed out a doll’s tea set, complete down to the matching spoons, that had been made by Roswell Gleason of Dorchester, Mass. He had acquired it from an auction, and the accession numbers on each piece indicated the set had at one time been in a museum. He said it was the only complete set he had ever had. Commenting after the show, Bette said they had sold well, to both advanced collectors and decorators. 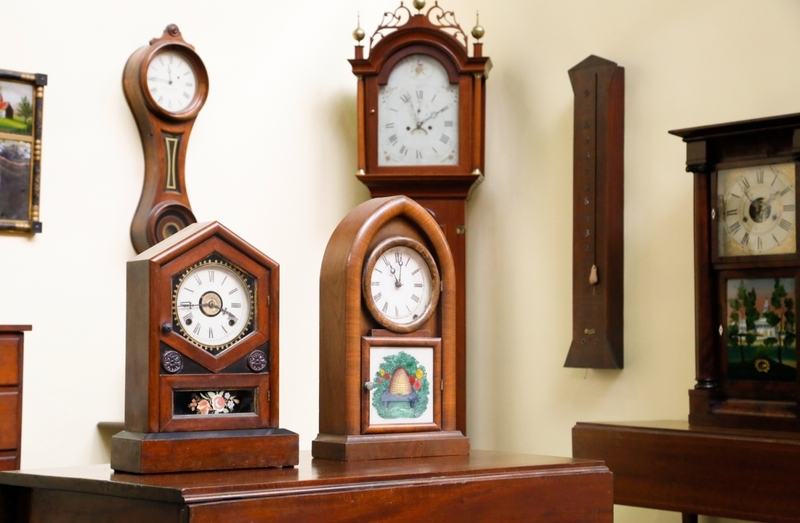 A few dealers brought clocks. 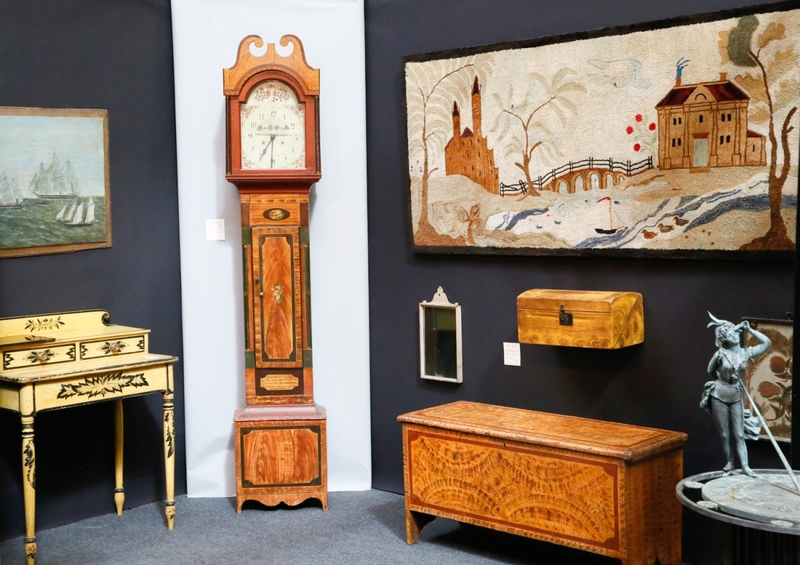 A standout example was a tall case clock from Shaftsbury, Vt., in the booth of Newcastle, Maine, dealers Jewett-Berdan, which had vibrant contrasting veneers and was acknowledged to be one of the finest known. 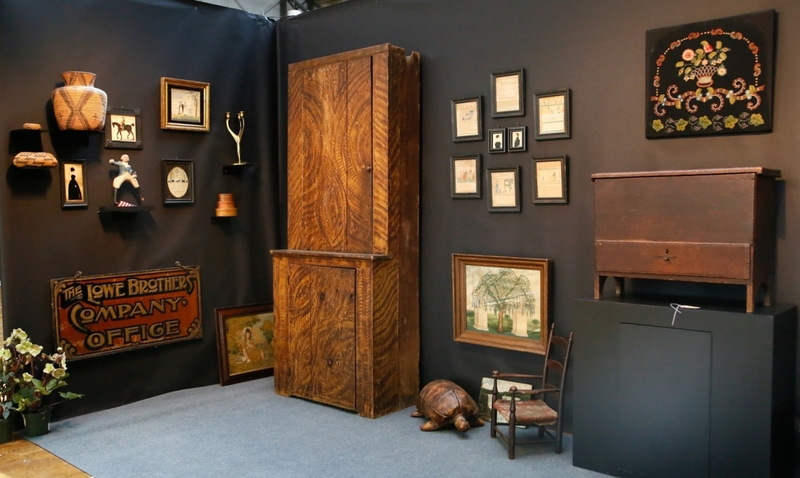 The largest selection was with clock dealer and restorer Kirtland Crump from Madison, Conn. An amusing “Hickory Dickory Dock” clock – complete with sliding mouse decoration – was his most unusual and whimsical offering. 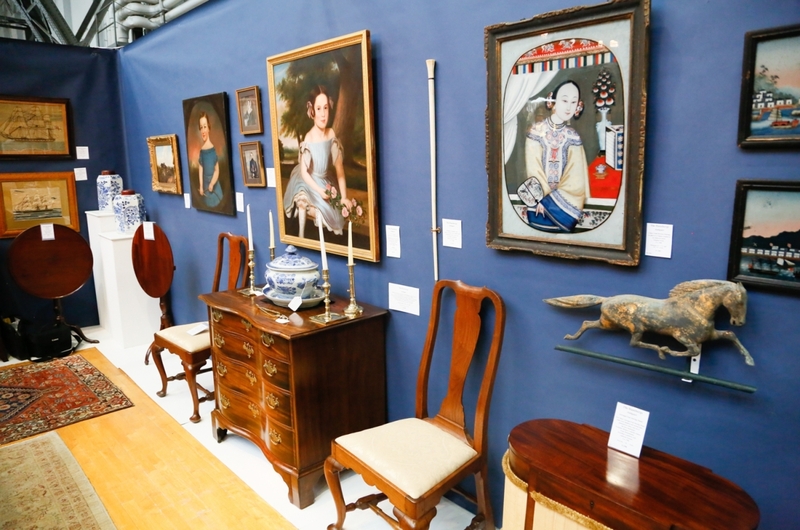 Several dealers brought modern works to show that they could be paired well with antiques. 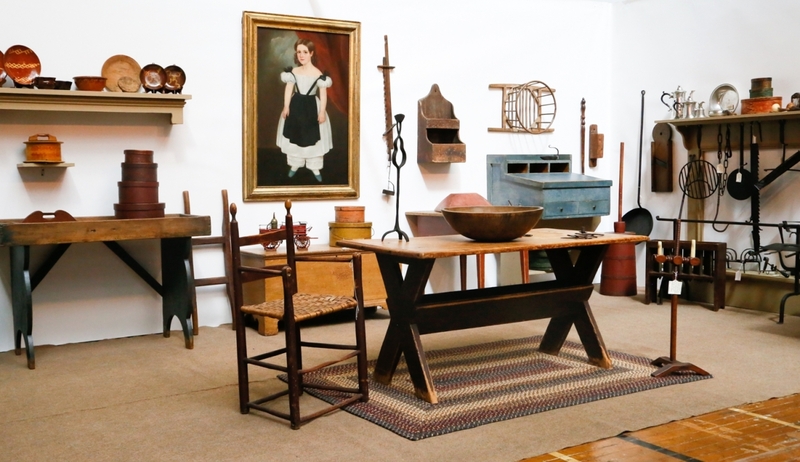 A group of three abstract works by Gualtieri dominated one of the side walls in the booth of Cooley Gallery, Old Lyme, Conn., while Paul Douglas, Odessa, Del., featured an N.C. Wyeth still life hung near an elaborate Aesthetic Movement side chair. Blue Heron Fine Art, Cohasset, Mass., went a step further, displaying porcelains that were like ones referenced in the paintings. Maria and Peter Warren, Sandy Hook, Conn., had a bronze dancer mounted on a pedestal that featured a drop-down door opening to a miniature bronze dancer. 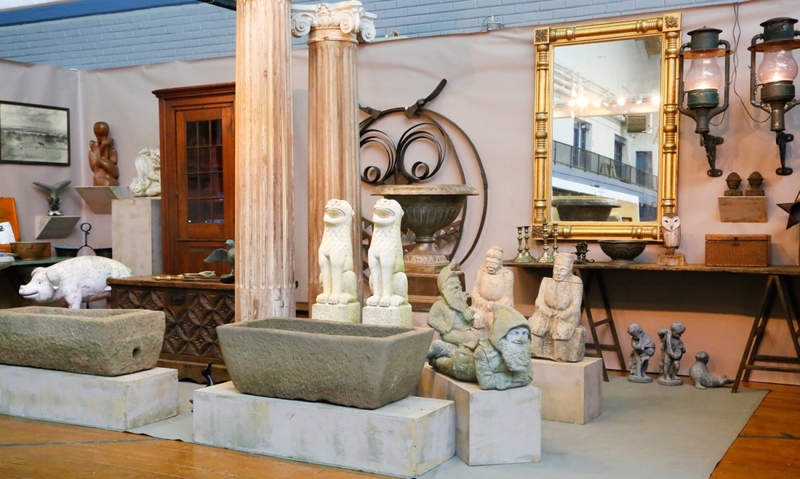 With warmer weather just around the corner – or, more specifically – no more nor’easters in the forecast, now is a great time to offer garden statuary, and there was plenty on offer at the show. The booth of Village Braider Antiques, Plymouth, Mass., highlighted a large brown-patinated owl sculpture, made from repurposed utilitarian objects. Bruce Emond said it was made by Maurice Bonnon, who had made several in different forms. Withington and Company, Portsmouth, N.H., had a great variety of stone, marble and iron pieces and architectural elements. If one looked closely, one could find jelly beans hidden throughout his booth. Some dealers reported selling Connecticut-made items. 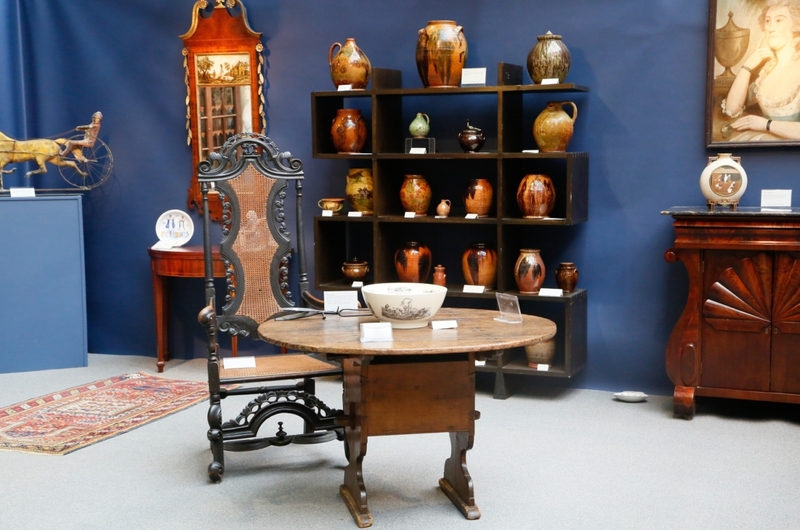 Paul and Karen Wendhiser sold an early Hartford bottle and an early Nineteenth Century mirror with Glastonbury, Conn., history, while Bob Haneberg sold a pair of chairs from Norwich, Conn., and Daniel and Karen Olson sold an Eighteenth Century Connecticut oval top tea table. 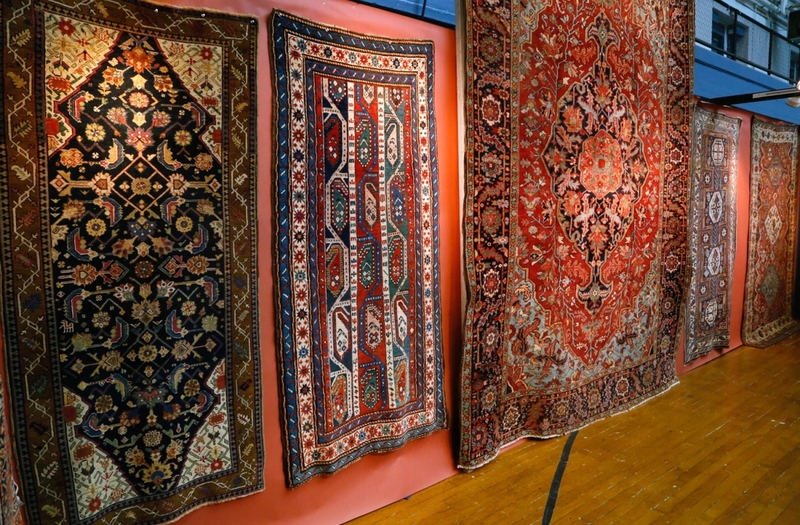 Several dealers commented after the show that floor had been consistently steady throughout the weekend and many reported good sales. Other dealers said they had been able to make sales both before and after the show, and many dealers reported buying things as well. There were some people who came back on Sunday to buy. Lewis Scranton was recognized for having participated in the show since 1968. He said he was going to retire from doing indoor shows, but would continue to sell at outdoor shows. His booth featured a wonderful early Scottie dog hooked rug that he said had unusually bright colors. 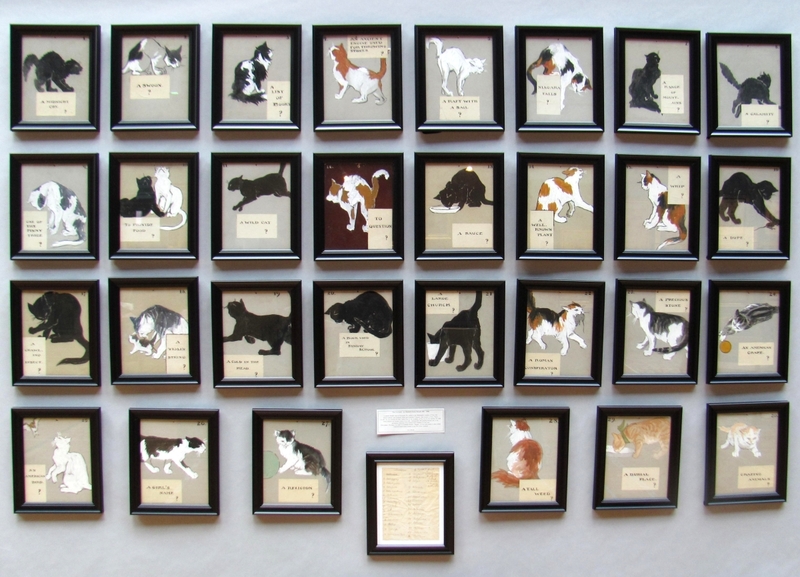 The show benefits the Haddam Historical Society. All of the exhibitors who reported back commented positively on the volunteers who helped throughout the show. The show plans to be back at the same time and place next year. 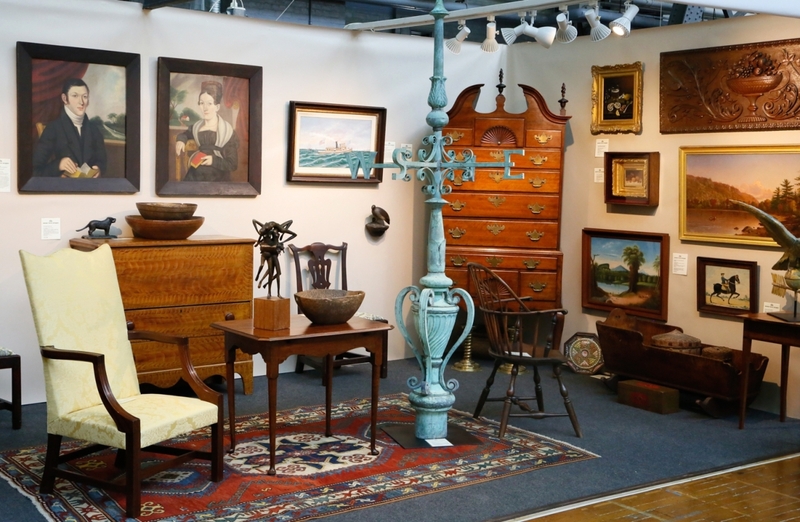 For additional information, www.ctspringantiquesshow.com or 860-908-0076. 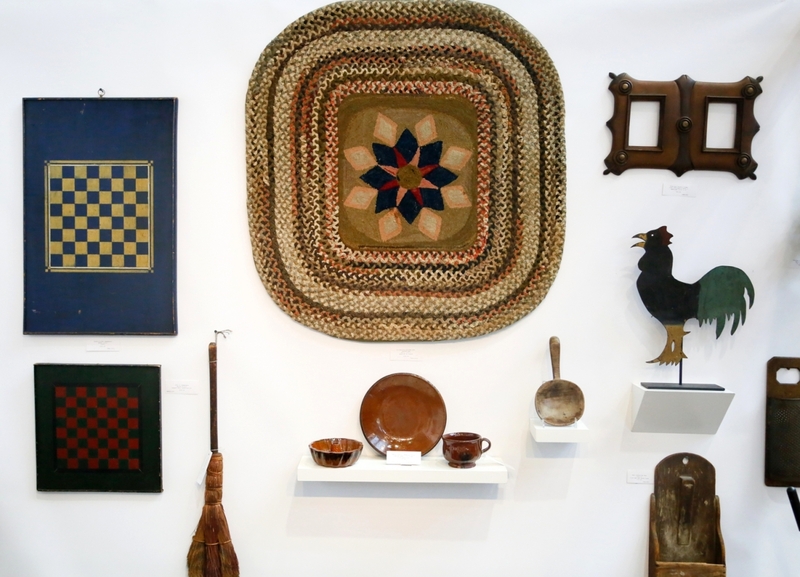 A wide array of folk art objects, lighting and garden ornaments were on show at Village Braider Antiques, Plymouth, Mass.